In 1775, George Washington took command of a ragbag army of American insurgents and took on the might of the British Army. Through a brilliant campaign of ambush and indirect attacks, he finally succeeded in defeating the greatest military power in the world, and won America its independence. Today it is the USA that is the world’s dominant superpower. When they entered Iraq in 2003 they made the same mistakes that the British made over 200 years ago: they underestimated the popular hostility against them, and believed they could fight a widespread insurgence using troops trained for conventional warfare. They are beginning to learn, as the British did, that sheer military power is not enough. As a former Director of UK Special Forces and Commander of the United Nations Protection Force in Bosnia, Michael Rose is uniquely experienced in counter-insurgency warfare. 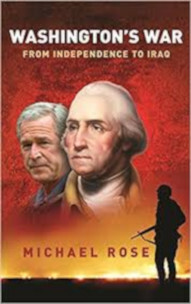 In this hard-hitting book he explains the principles of guerrilla warfare as used in the American War of Independence, and shows how those same principles have been adopted by the insurgents in Iraq. The story of how George Washington beat the British out of America – and how Iraqi insurgents are now using the same tactics to push the Americans out of Iraq. First published by Weidenfeld & Nicholson (Hachette, UK) in 2007.